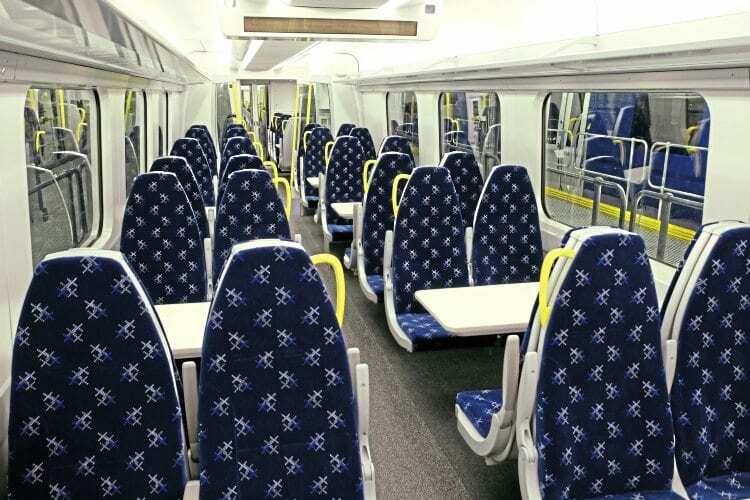 SCOTRAIL has unveiled the interiors for its new Class 385 EMUs. Hitachi is building 70 sets at its County Durham factory – 46 three-car and 24 four-car trains. Each pair of seats will have power sockets, and there will be increased luggage space and free wi-fi, as well as space for cycles, a flexible storage area for such items as prams and golf clubs, two wheelchair spaces, and an accessible toilet per set. The accessible toilet will have a new ‘assist’ facility to allow companion access to the cubicle while maintaining privacy. ScotRail has also stressed the seats and windows will be closely aligned. In First Class, passengers will have premium leather seats, LED lighting, additional luggage storage, and a plug socket at every seat. The trains also feature remote monitoring for faults and other issues. Two units are on long-term test, while another 15 trains have been completed, but not fully commissioned or accepted. Introduction of the full electric service between Glasgow-Falkirk High-Edinburgh needs 21 accepted trains, so it may be February or March before this new operation begins.